A stunning retro coffee set. 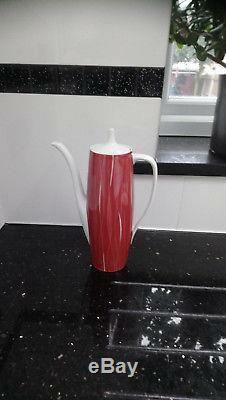 In excellent unmarked condition from the famous porcelain manufacturers Cmielow. A set compromising 6 cups and saucers a sugar bowl, cream jug and coffee pot. The coffee pot is 9.25" high, excluding lid, the jug is 5.5" tall, sugar is 3.5" excluding lid and cups are 3" tall. Designed in 1960 - 1961 by Wincentry Potacki, the design of the set is called Goplana. The pictures show the coffee set to be slightly red but the actual colour is a rusty redish brown, as shown on photograph no. I will pack very carefully and send via courier. As the porcelain is fragile I will ensure that the items are well packed and doubled boxed. The item "Retro vintage Cmielow 6 person porcelain coffee set design by Wincentry Potacki" is in sale since Sunday, March 04, 2018. This item is in the category "Collectables\Vintage & Retro Collectables\1960s". The seller is "dazzledbydeco" and is located in Gillingham. This item can be shipped to United Kingdom, Austria, Belgium, Bulgaria, Croatia, Cyprus, Czech republic, Denmark, Estonia, Finland, France, Germany, Greece, Hungary, Ireland, Italy, Latvia, Lithuania, Luxembourg, Malta, Netherlands, Poland, Portugal, Romania, Slovakia, Slovenia, Spain, Sweden, Australia, United States, Russian federation, Canada, Brazil, New Zealand, China, Israel, Hong Kong, Norway, Indonesia, Malaysia, Mexico, Singapore, South Korea, Switzerland, Taiwan, Thailand, Chile.